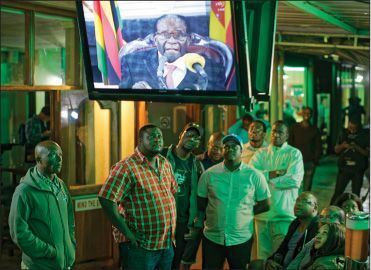 Zimbabweans are cheering the downfall of a despot, said The Sunday Mail (Zimbabwe). President Robert Mugabe, 93, the only leader Zimbabwe has known since independence in 1980, was effectively stripped of his powers after our patriotic military took action last week to cleanse the ruling ZANU-PF party of corrupt elements. The intervention—which is not a coup—is wildly popular. Over the weekend, Zimbabwe’s capital, Harare, was “a sea of singing and dancing people from across political persuasions, who all had one call: national renewal.” This week, ZANU-PF officials expelled Mugabe from the party, and since he stubbornly refused to resign as president, they started impeachment proceedings. Mugabe didn’t start out as a greedy authoritarian, said Wongai Zhangazha in the Zimbabwe Independent (Zimbabwe). In the 1960s and ’70s, he bravely fought against white minority rule. And in the decade after he took power, Mugabe transformed Zimbabwe for the better, offering free education and health care “as well as a reliable social welfare system that provided a safety net to millions.” Literacy soared and child mortality plummeted. But around 2000, Mugabe ceased to be a man of the people. His violent land reform program devastated the agricultural sector as his cronies confiscated white-owned farms, ostensibly to be redistributed to the poor but more often shared among the party elite. A decree that foreign firms must cede to local ownership caused investment to flee. Now Zimbabwe, once Africa’s breadbasket and a manufacturing power, has food shortages and 90 percent unemployment. No wonder we’re cheering the military.